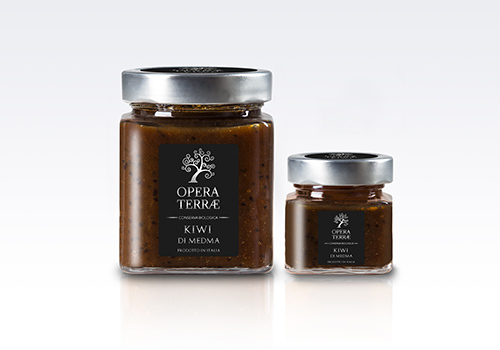 A miracle of nature, the kiwi embodies the charm of oriental flavours and velvety soft caress of the Calabrian sun. Originally from Southern China, the kiwi is characterized by its brown-green peel and its juicy, sweet and sour flavour. It is high in nutrition. 100 grams of pulp in fact contain about 200 milligrams of vitamin C.
Our kiwi belong to the Hayward variety. They ripe on the middle of november. Generally kiwi are harvested when they reach 6 Brix degrees but we decided to leave them on the trees till they reach 9/10 Brix degrees, so that kiwis can achieve a higher sugar level. This method lets us not to add sugar during fruit transformation phase into preserve. Organic kiwi preserve without added sucrose. Ingredients: organic kiwi, organic apple juice. Fruit used: 130g for 100g of finished product.